Access Christian’s chapter on African American soldiers and military justice here for free. In Becoming American under Fire, Christian provides a rich account of how African American and Irish American soldiers influenced the modern vision of national citizenship that developed during the Civil War era. 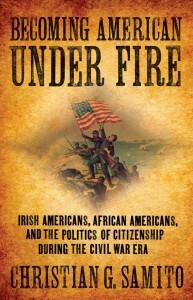 By bearing arms for the Union, African Americans and Irish Americans exhibited their loyalty to the United States and their capacity to act as citizens; they strengthened their American identity in the process. Members of both groups also helped to redefine the legal meaning and political practices of American citizenship, resulting in a more modern, nationalized, and better defined concept of citizenship as embodied in the laws and US Constitution. As a political creation and legal concept, citizenship determines official membership in a country and helps define the duties individuals owe to it as well as the rights they enjoy; on a social and cultural level it helps define inclusion and exclusion in a community, as well as personal identities and allegiance, and thus collective patriotism. For African American soldiers, proving manhood in combat was only one aspect to their quest for acceptance as citizens. As Christian reveals, by participating in courts-martial and protesting against unequal treatment, African Americans gained access to legal and political processes from which they had previously been excluded. The experience of African Americans in the military helped shape a postwar political movement that successfully called for rights and protections regardless of race. For Irish Americans, soldiering in the Civil War was part of a larger affirmation of republican government and it forged a bond between their American citizenship and their Irish nationalism. The wartime experiences of Irish Americans helped bring about recognition of their full citizenship through naturalization and also caused the United States to pressure Britain to abandon its centuries-old policy of refusing to recognize the naturalization of British subjects abroad. As Christian makes clear, the experiences of African Americans and Irish Americans differed substantially—and at times both groups even found themselves violently opposed—but they had in common that they aspired to full citizenship and inclusion in the American polity. Both communities were key participants in the fight to expand the definition of citizenship that became enshrined in constitutional amendments and legislation that changed the nation.